The first Bada had a number of serious downsides like the very limited multitasking, the not always working interface but it was packed with features right out of the box. 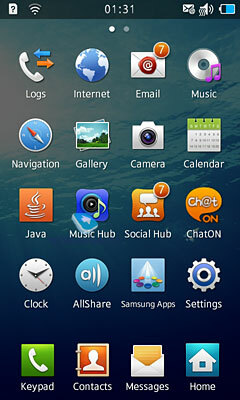 The 2.0 version concentrates on the user interface above all – developers apparently tried to make it very similar to Android experience. Bada 2.0 seems like an Android OS version rather than a completely different system. They have a lot in common now and they have lots of differences too. 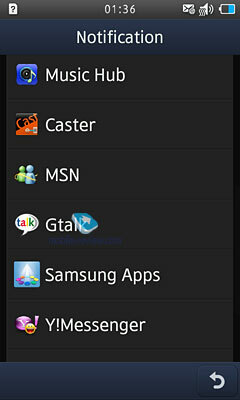 Bada has become a cheaper version of Android which does not have that many apps available for it. Even Skype is still not available for Bada and no one knows whether it ever will. There are a lot of new features in Bada 2.0 – new neater controls, better SMS messaging (lots of problems have been fixed), MS Exchange integration (mail, calendar, tasks). 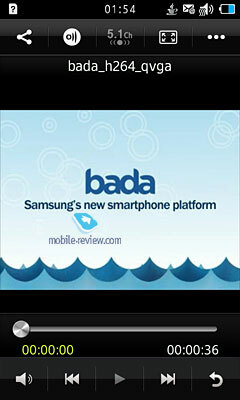 This article is a preliminary review of Bada 2.0 as tested on Wave III prototype and some features were not working like Samsung’s IM service ChatON. We will keep you up to date as the system receives new features. 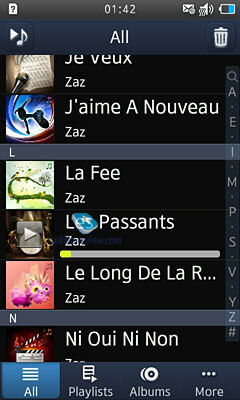 Bada 2.0 features the new Touch Wiz overlay with a number of significant changes. 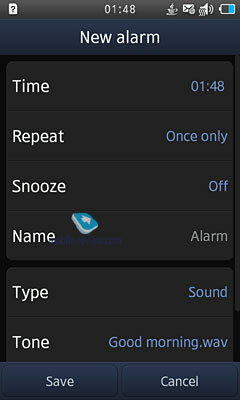 Firstly, the lock screen now has only one designated widget panel – it has a square icon in the screen menu. 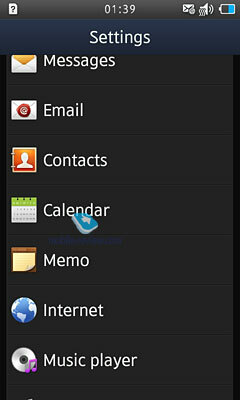 It only supports native Samsung widgets like contacts, calendar, news feed etc. you cannot add other widgets here but you can have them on the other screens. You can create shortcuts to web pages, create folders and even separate files. Quite possibly in the future adding third party widgets will be available. 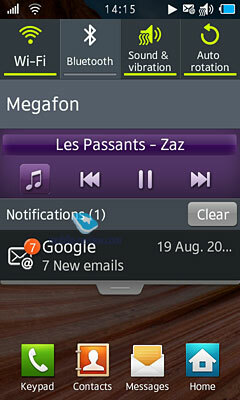 Secondly, SMS and missed calls notifications are now very similar to those in Android. No more jigsaw puzzles – you just need to pull the bar to get to the missed event. You can always get back to the Home screen by pressing the Home icon at the bottom. The home screen itself is a 3 by 4 matrix. Data input is quite usual and simple – in practically any menu switching to landscape mode opens the QWERTY key pad. 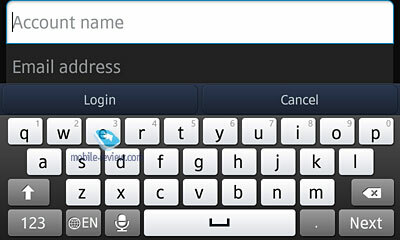 There is also handwriting recognition and Swype (drawing wards on QWERTY key pad). 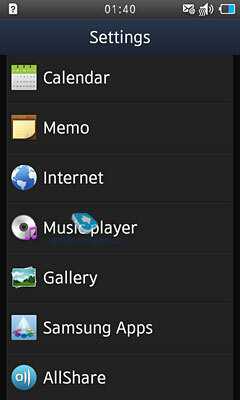 You can customize the Home screen as much as you want – only the Home icon is not removable. Scrolling through lists. Swiping on the left of the screen gets you through lists a lot faster than swiping on the right – this is a kind of a tiny detail that makes everyday use a lot easier. Alphabetical lists prompt you with first letters so you can quickly scroll to the letter you need. 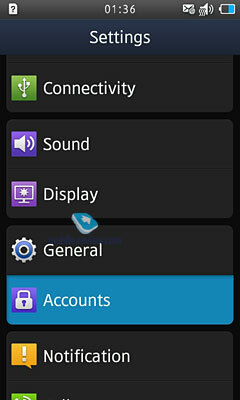 Now there is also a pop up status bar with four icons: GPS (on/off), Wi-Fi, Bluetooth, Sound. 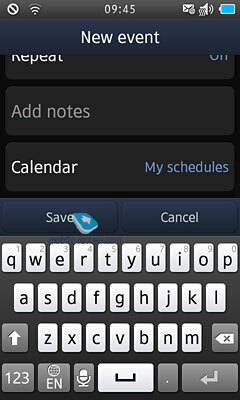 It also lists all events like new SMS, mail, missed calls etc. It all looks very similar to Android. 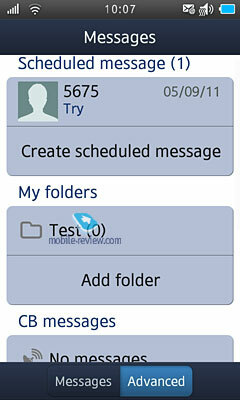 New SMS are displayed with the name of the sender and the first few words of the message. Most bundled apps, like Twitter, Facebook, Samsung app store, support PUSH messages. In the settings you can give these apps the permission to display notifications then the on the lock screen you will see pop up notification messages. For example, if someone writes on your Facebook wall you will be notified immediately. This might be very convenient but this feature goes really hard on power consumption especially if you get lots of messages. In this mode the battery will only last a day instead of the normal two on Wave III. 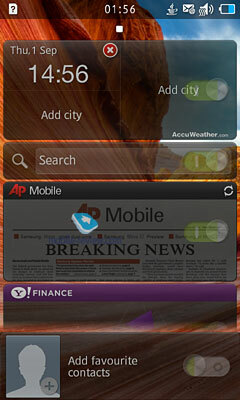 Pressing and holding the Home button opens the list of currently running applications – you can switch between apps. You can stop particular apps or all at once. Multitasking works fine, you can have several apps running on the background. However, closing apps by pressing the End call button is not always convenient. When you minimize an app by pressing the Home button it continues to run and all your data is safe – you will continue right where you paused it (although some games I tried restarted after minimizing). All in all, multitasking is no problem except when you work with the browser and some other resources hungry apps then the phone starts to lag. So I strongly recommend monitoring running apps and stop the ones you don’t need at the moment. By default you have a mini QWERTY key pad – the key are properly sized and typing is pretty comfortable. Holding the space bar switches between different types of characters – it really speeds up typing. At the first phone start up you can select any number of languages to be used with the key pad. It takes only one tap to switch between languages. 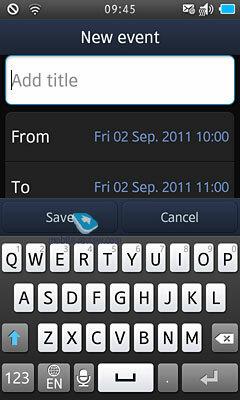 T9 works fine – while typing you get prompted with word variants in a drop down menu. Only you don’t really need T9 while using the QWERTY key pad so T9 is off by default. The regular phone key pad is also available, in this case you have a few characters on every digit button and you have to press the key several times to get to the letter you need. And, as usual, there is handwriting recognition feature. It supports the full screen mode or you can use a small dedicated window. 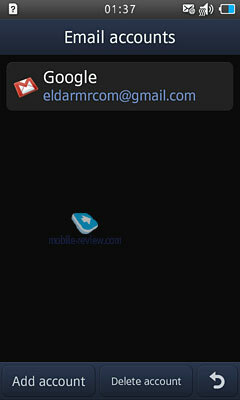 You can view your contacts by pressing the Contacts icon at the bottom of the screen in the quick launch bar. 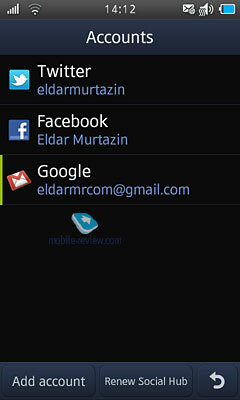 The contacts list displays contacts from both the phone memory and your SIM. 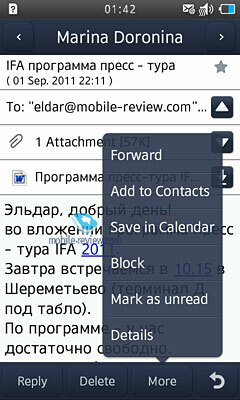 There are three tabs of contacts: all, groups and favorites. The list is customizable for left handed people – the slider then appears on the left. 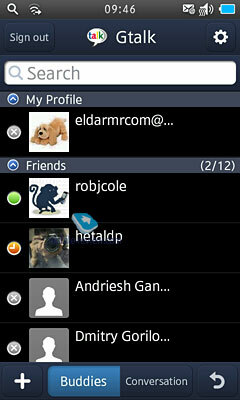 The contacts are displayed as names with contacts’ pictures to the left of them. 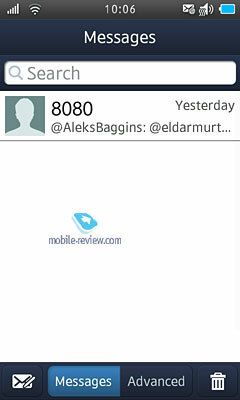 Tapping on a contact opens the contact card with detailed info. You can use any image file including your photos and videos for a contact’s avatar. Each entry can have up to five phone numbers of different kind (mobile, office, home, fax, other), one of them becomes the default phone number (the first one if you don’t specify otherwise). You can add additional info to the entry like email address, postal address etc. (listing works only by the first name). The maximum length of each field is 20 characters for any of the supported languages. You can use more than one language when typing in a name. In the list first come names typed in the local language and then in English – easy and comprehensible. You can quickly switch between languages when searching for an entry so having contacts written in many languages is no problem. You can sort contacts either by the first or the last name. You can add several email addresses to every contact entry and also add a small description. 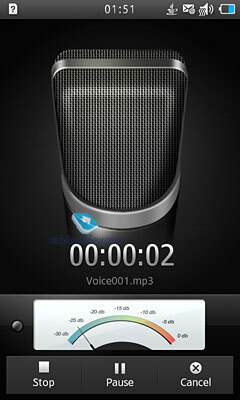 You can have any sound or an mp3 file set as the ringtone for every contact. You can create any number of contact groups and assign individual ringtones and pictures to them (by default there are three groups and no group) with up to 20 contacts in each group. You can also set custom tones for SMS. The phone can store up to 2000 contact entries with all the fields filled out. The number of contacts does not change if you fill only some of the fields. In the settings you can specify where you want to store all new contacts. You can move contacts from and to your SIM. 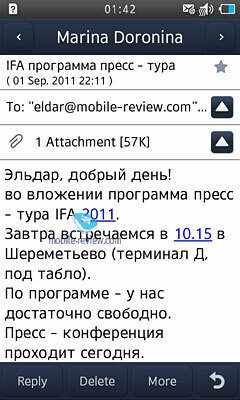 The developers for some reason decided that the best way to sync contacts is a PC or MS Outlook to be precise. You can send a contact card via an SMS/MMS, email or via Bluetooth. The e-cards are then easily recognized by the other device. You can create your own e-card in the phone in the standard format. The quick dial supports up to 12 numbers, you can add different numbers of a single contact to the quick dial list. 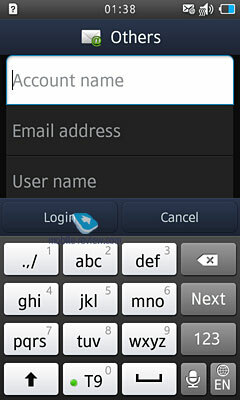 Then on the key pad you see the name of the contact under the digit key or his picture but you cannot see the number type (mobile, work etc.). During an incoming call the contact’s picture takes up about half of the screen so it’s quite easy to recognize the caller. 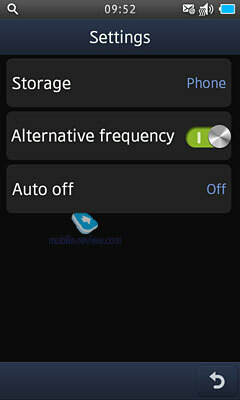 You can assign one of the five kinds of vibration alert to any of your contacts. The new feature of this OS version is that you see four tabs when viewing a contact card: the first one contains the contact info, the second one is History (the log of messages and calls), then come Activities (the contact’s posts and messages in Twitter/Facebook). It is really convenient to have it all in one place. The last tab is called Media – it lists the contact’s files from Flickr and other social services. We have seen a similar solution in HTC Sense – Samsung has adopted this interface feature and it is very convenient to use. If you have a Gmail account you can sync all your Gmail accounts with the phone as well as your contacts from Facebook or Twitter. 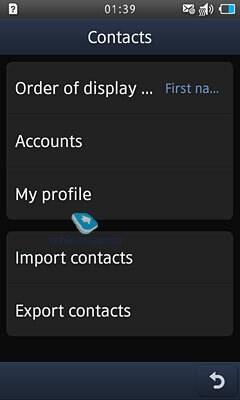 Imported contacts will have the respective social service icon next to them. You either import all contacts or only specific ones. Then you will see all the recent activities of each contact in the Activities tab. This feature works nice (you can even respond to messages or posts from the Activities tab) and looks very slick. The common log lists all events including Facebook, Twitter posts and SMS/MMS/email. I could not find how many events it can store – I got it to at least a hundred. You can view only phone calls and then sort them by type: incoming, outgoing or missed. You can quickly switch between lists. Each entry in the log displays the time and date of the call and the rest of the history of communication with this contact. Same calls are grouped and next to the phone number you see the number of calls. As usual, you can see the total call time and the cost of phone calls (if you have this service). You can blacklist numbers to ignore them automatically. You can also view a separate list of sent messages. As well as other manufacturers Samsung no longer differentiates between SMS and MMS – you create a message and then depending on its content it becomes either an SMS or an MMS. But you can still make a message an MMS manually (for example if you want to send a message to an email bypassing the mail client). You can view all sent and received messages as a chat. In this mode slit messages are not displayed as one – you will have to select them to read the whole message which is not very convenient. But it’s nice that the chat view displays both SMS and MMS. You can sort messages by date, name or by frequency (most contacted first). A unique feature this OS has is the scheduled messages delivery. You can type a text and then specify the time and date you want this message to be sent. It is a very nice feature and I am sure many people will find it useful. 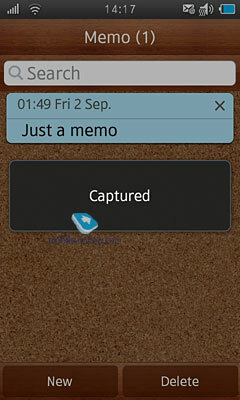 You can also archive text messages to the memory card. 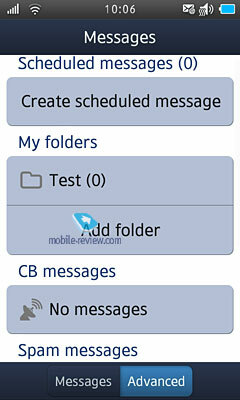 You can store up to 1000 messages in the phone memory. 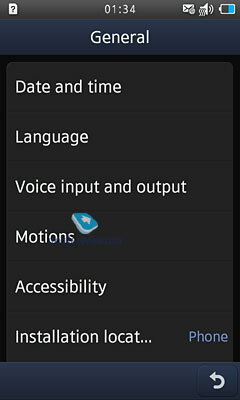 The OS supports the EMS standard compatible with Nokia Smart Messaging. When sending a text you can select the addressee from the phone book, the recents or from a group. You can blacklist messages from numbers you specify – messages received from these numbers will be automatically deleted. You can move messages to your own folders. 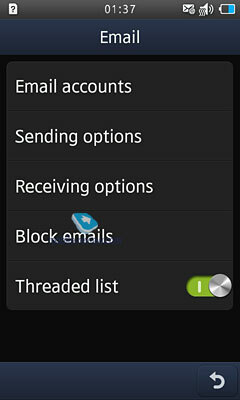 You can block unwanted emails by address or by the subject. The MMS size is limited to 295 KB while the size of incoming MMS is not limited. 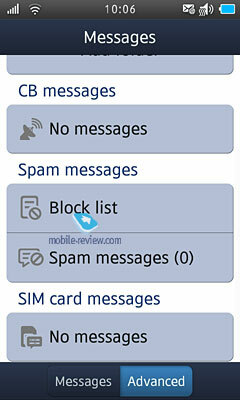 In the settings you can enable ad blocking, select the type of message delivery in roaming and in the home network. SMS and emails are stored in the common dynamic memory. There is also a useful feature of the emergency SOS message. If you enable it then pressing the volume rocker four times will send the message “I am in emergency. Please help me” to the contacts you need to specify (up to five numbers). Phone calls and SMS from these numbers will then be accepted automatically. You can specify the number of times the message will be sent but you cannot edit the text of the message. The preinstalled mail client is very basic and does not have any cool features. You can set up to five mail accounts. The number of messages is limited to one thousand for each account. The client supports attachments but the limit for outgoing messages is 1MB, for incoming messages the limit is 5MB. You can view received attachments in the default browser that supports HTML and displays pages correctly. There is also a set-up wizard that can help you set up your mail accounts. The phone memory keeps up to 500 entries represented by meetings and 100 anniversaries. Each entry has time, date and the end of the event. You can also select an interval for the signal, which can be repeated (choose the repeat time and exception, which is convenient). 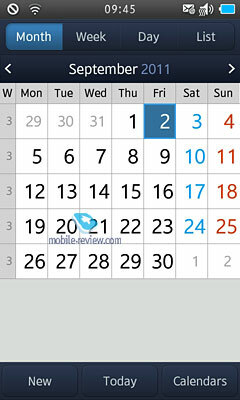 The calendar can be viewed for a month or week with different colors for specific events. The calendar is displayed both horizontally and vertically. Unfortunately, it is impossible to enter events directly by clicking on a calendar date or there is no three activities display mode when viewing each month. Notes are standard, but look nice. Tasks keep up to 100 entries with different priorities. Time unites several features including world time. You see time for selected cities and on the map you set time zones. The lineup is completed with alarms, countdown and timer. Converter changes various measurement units from the always visible list. Dictaphone. You can record up to several hours of voice notes with the unlimited number of recordings. Users set the limit themselves and it can be 1 hour. All recordings are saved in a separate folder. The recording quality during lectures and round tables is pretty decent and can be deciphered later on. To some extent the phone replaces a digital dictaphone and can be used during the conversation. Bluetooth. The utility looks unusually and allows viewing devices map similarly to some desktop managers. You can also switch to the standard devices list. All features are supported without any limitations. Games. Java applications enjoy multitasking. Several apps can be run and minimized. The subsequent activation of the app is possible from the list. 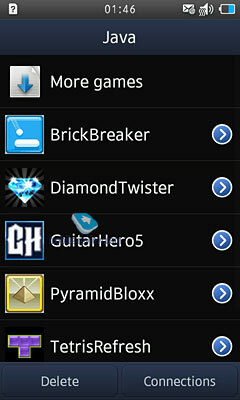 The number of preinstalled games varies depending on the market. Google section is dedicated to the eponymous search engine. In fact it is a browser with the Gmail access and a fully functional Google Maps (in the commercial version you may find Route 66 navigation instead). 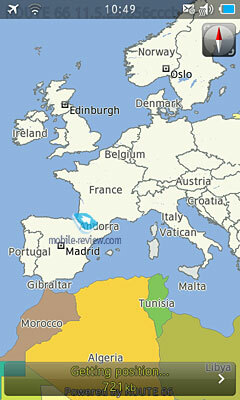 Maps are standard, but you will surely enjoy the screen size while scrolling with hands. All controls are from the screen. Choose between the satellite image and the map. Location is determined with the help of base stations. There is nothing special here. Finally, the inbuilt GPS receiver is supported as well. It continues where Jet left off and is based on webkit 2.0 (Dolfin). The differences from NetFront are dramatic: the user experience remains the same, but we get several unique features. For the first time we can customize the brightness in the browser itself, which is very convenient if you are outside. Flash helps viewing all websites without limitations (developers discuss if to keep Flash at the end as it is responsible for the instability of the browser). It is one of the first to have an inbuilt ban on banners viewing. We tested the option and it worked quite well. Here we have access to all files: music, images, video and sounds. All downloaded files get into this location. On the downside we should note that often a particular file is not represented in the list immediately and you have to leave it and enter again first. Files are represented as a list and icons. You can select one or several files. The following operations with files are supported: copying, deletion, transfer (phone memory and memory card). Files can be sorted by time, type, name and size. In the general list files are selected from both types of memory by default. Traditionally you can protect any section of the phone by a password. You see the time of the screen backlight and brightness. 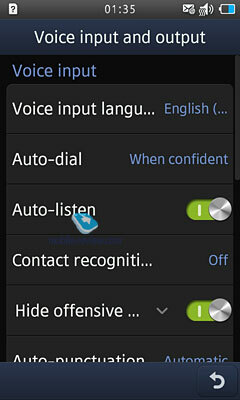 There are no special or unusual settings in the phone. 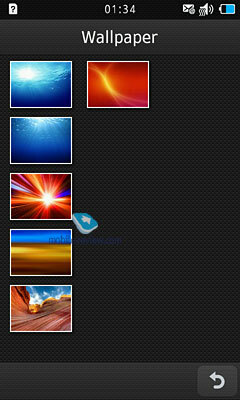 Different wallpapers are available. 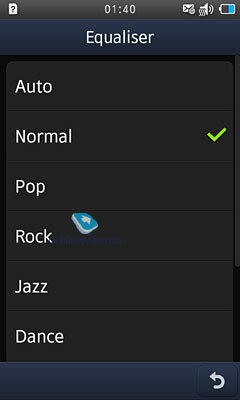 There are profiles to change the settings quickly. 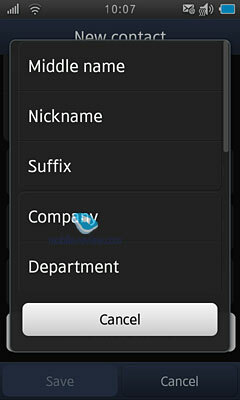 As always you can select the font size for dialing together with its color and style. For VibeZ the power of vibration can be also customized. The phone supports TV Out. Mobile Tracker works in the following way. 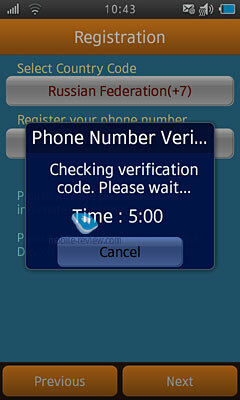 You enter the phone number to send messages if the SIM card is changed. In this message you will see the number of the SIM card used in the phone. The section is accessible only with the password, which makes it impossible to deactivate this feature if you do not know the password. 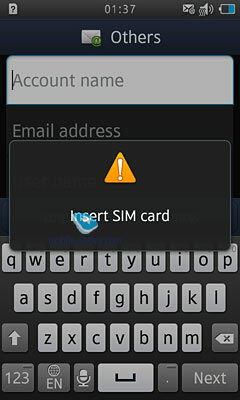 When the new SIM card is installed you get the message only once. Any new card change will activate another message. This useful feature helps you to increase the chance of recovering a stolen handset. 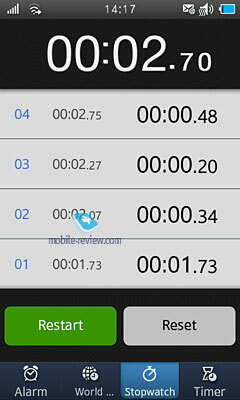 Briefly speaking Picsel Viewer is an application to view MS Office (for example, MS Word, Excel, PowerPoint), Adobe Acrobat (PDF), graphic and video files on the phone. The main advantage is the speed of operation: a 20 MB PDF file can be opened within seconds and then you can scroll pages, scale or rotate them in any way. There is no files editing available, but often only viewing is enough especially as you do not have to convert files to use in a mobile device. 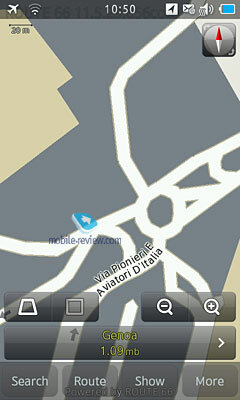 Navigation uses Route66. This fully functional application allows turn by turn navigation, has voice tips and other traditional options. I doubt that many will pay for the full version of the app, because navigation is not the main feature here, though some may find it useful. My accounts is the only place where all social media accounts are united. The main account is that of Bada, which gives access to its store among other things. Allshare is a utility based on the uPnP standard, which allows streaming files from other devices through WiFi. For example, you can install a server app onto your laptop to send music, podcasts and video to the phone. Everything worked well. 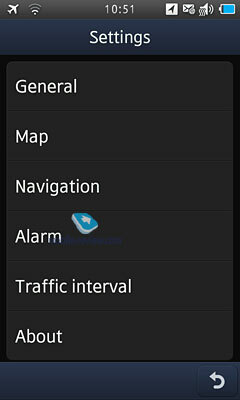 It is a new option for S8500 models, though many are familiar with it from Nokia handsets on S60. The player had a major overhaul and now it integrates Disk UI. When you open the player in the standard screen orientation you see the list of all tracks. Browse titles horizontally to view playback titles (they contain both your lists and automatic ones – frequently played, fast search and recently played). In the same place you have a filter by performers and albums. In both cases you can view covers instead of titles. 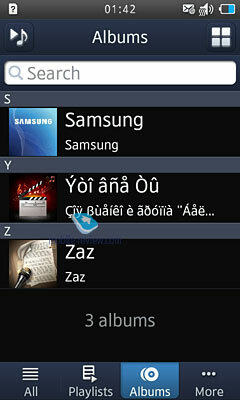 To enhance the visual appeal Samsung adds default pictures to albums and performers lacking ones. It may disorient you initially due to the multitude of colors. The inbuilt search enables browsing within performers or tracks by letters. Now let’s move to the horizontal mode. Toss the phone around and you see a carousel of CDs similar to cover modes in other models. For example, Samsung Jet offered something similar. Choose the required disk to see the tracks list and select the one you need. Begin the playback and enjoy. These are not the only features here. If you drag the screen with covers down you will see a circle to search for performers, tracks and albums by letters. The controls are very convenient and really indispensable if you have many tracks. Watch the video to see how it works. 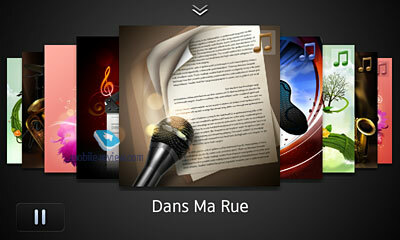 The looks of the player can be different with the album cover or the equalizer. I like the first option as the second one is way too bright. In other respects we have a standard Samsung player. There is random, consequent or cyclic playback of tracks. 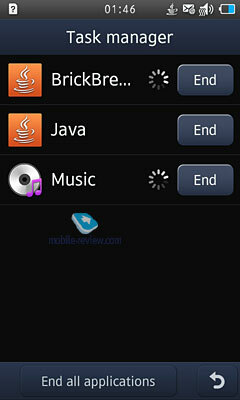 MP3 files can be downloaded directly through Bluetooth or from the synchronization app or Windows Media Player. Files can have any title or tag in different languages. Files bitrate is not crucial as well as the player accepts almost all formats. WMA, AAC, eAAC, eAAC+ are supported. During the playback you see the number of the currently played track and total number of tracks. The equalizer is present, but you cannot customize it. 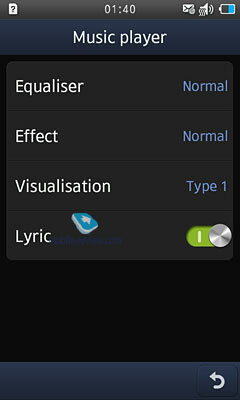 The playback is effected via stereo headset or in the hands free mode. 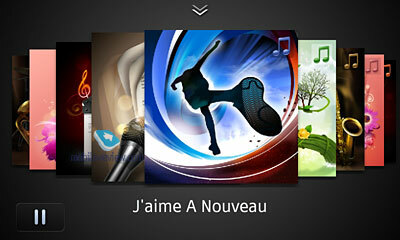 Volume has 14 levels and users can create their own playlists. If the player works in the background mode the screen displays the track title and tips for controls, which is nice. On the standby the minimized player shows controls and the currently played track. In the hands free mode the speaker is not clear enough, but the overall volume is fine. Music playback with dedicated headphones is more impressive. I like this phone among music offerings most of all. Subjectively, it can be influenced by the overall positive impression from the model. 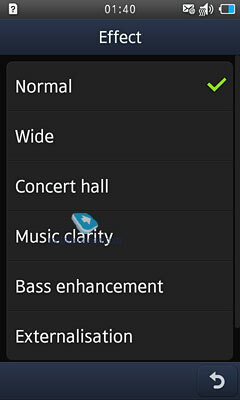 For music playback via the headset capitalize on the 5.1 Surround mode, which boosts the volume of the recording. It is a rival of Dolby Mobile. 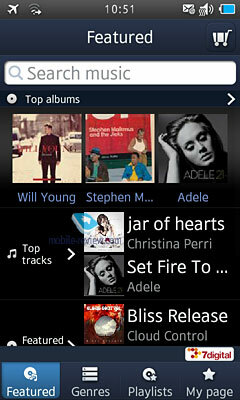 Find Music (earlier known Music Recognition) is an analogue of TrackID from Sony Ericsson. A recorded fragment is enough to identify the performer and the track. Among the advantages there are many performers in languages other than English, which TrackID lacks. 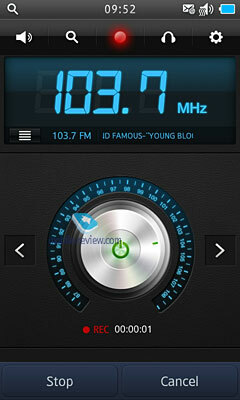 FM radio. In the memory one can store up to 99 radio stations between 87.5 and 108 MHz. There is an automatic tuning of all stations, but separate channels cannot be assigned particular names and they are always represented as frequencies. Radio is operational in the hands free mode too. Not all radio stations are found easily, but it is on par with models from other manufacturers. Radio can work in the background mode too. RDS shows not only the station name, but other information as well. Radio stations can be stored. You can choose settings directly from the player and select the picture coloring (cold or warm). Other characteristics are traditional: х8 fast forward, jumping into the other segment of the file by dragging a slider and DNSe support. The manufacturer claims the support of HD video playback if you need it. The following formats are supported: MPEG4, H.263, H.264, WMV, DivX, and XviD. Almost all files from network sources were played easily. Taking into account the quality of the picture this phone becomes one of the best players. The picture can be scaled to fit the screen or retain the original form (for example with black stripes on sides). In MKV files subtitles are supported and can be activated/deactivated from the menu. In the second incarnation of Bada Mosaic Search was ditched and the video editor is also absent. 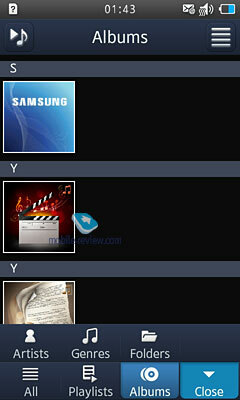 Photos are displayed as miniatures and the list opens quickly without any delays even if you have many images. 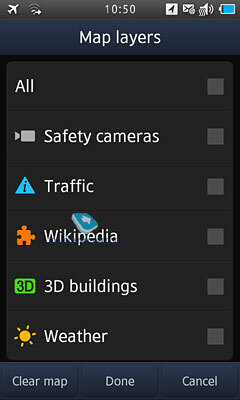 The gallery follows the Android style in appearance. In the list filters are available. Sort pictures by tags, date or view only favorites. 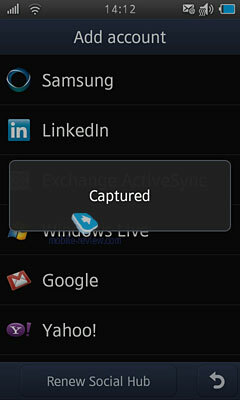 Traditionally you can start the slide show or send a particular photo to other devices via any tool including Bluetooth. Heavy users of social networks can instantly upload images to the desired network. Images scaling resembles that of Apple iPhone: move fingers to or from the center with the multitouch to boost or minimize the picture. Synchronization. New Samsung Kies suite is supported, but we will discuss it separately. It is an updated version of New PC Studio with advanced synchronization options. 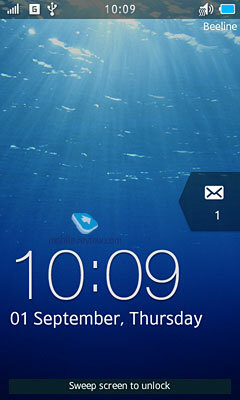 The phone supports Microsoft Exchange too. Voice dialling. 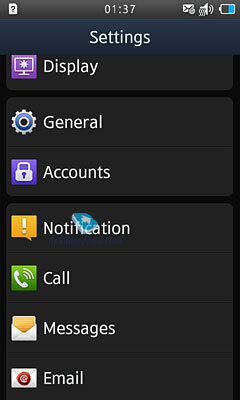 Vlingo is supported and is also used in Samsung Galaxy SII. In one location you get access to all accounts: e-mail, social networks and IM. You do not have to switch between different apps to control your activities. Go to the menu and open the application when you choose it. The idea is sound, but what makes me happy is that you even do not need to go into this menu. In the phonebook all information is displayed immediately and new messages pop-up to be answered similarly to SMS. We should pay special attention to social networks apps like Facebook. The client is excellent and can do almost everything. I have no complaints to it whatsoever. It is on par with the best solutions on other platforms. Twitter is not that good, because update shows no more than 5-8 entries, which is definitely not enough. Saving on traffic this way is a crime against ergonomics. You have to press “update” all the time. In settings you cannot determine how many tweets can be displayed. You can click on the friend and view the profile or write an answer. Names in tweets are not shown as links, which is a pity. Overall the features of the app are average and sometimes you feel certain limitations. IM client is pretty good. 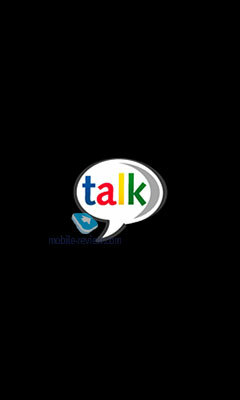 We get Google Talk, AIM and several other solutions will be added soon (not Skype or ICQ, at least for the time being). 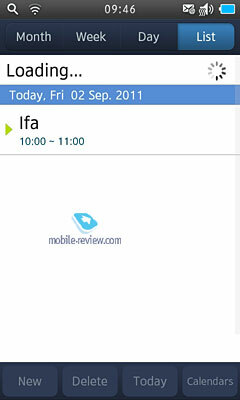 In the phonebook opposite to the caller's name you see an IM icon to start the conversation if the person is available. Once again there is no need to go to the app. 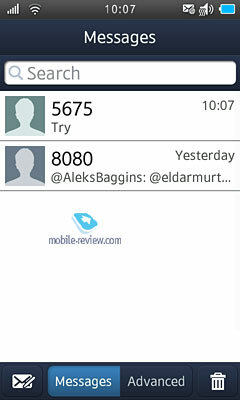 You can open it though if you prefer to see all contacts in one place. 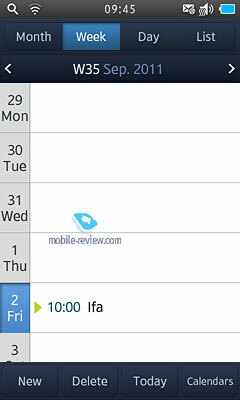 Calendars are similar to contacts as you can drag online calendars (for example, Google Calendar) to the screen. Different colors show entries from different sources. 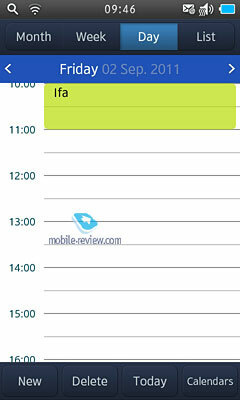 You can also view all events in the general calendar. 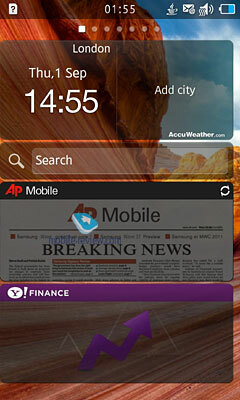 Samsung decided to facelift the Bada interface by redesigning available features and integrating third party apps (for example, Route66 and Vlingo). It is the main innovation that attracts attention. Unfortunately, the superiority of Bada 2.0 over initial versions is not crucial. In comparison with the development of Android Bada is much slower. It means that Samsung has finally decided that it is an entry level variation of Android with fewer features. Why Bada is not developing faster then? I did not see enough changes in this long-awaited update as they are more on the surface.